I often ask my Mom for recipes I remember her making when I was a child. This is one of those! I baked cookies a lot with my Mom when I was little – I think it’s a huge part of the reason that I LOVE to bake as an adult, and hopefully the trend will continue in my children. My 3-year-old daughter asks me to bake with her every single day, so I guess it’s safe to say I have a sous chef in the making! These delicious cookies are soft and very chocolaty, somewhat reminiscent of a brownie in cookie form. The reason the are “Long Lost” is that the recipe for them was found in a book that my Mother had borrowed from the library many years ago. When she made the cookies for the first time, and they didn’t turn out all that well, she returned the book and froze the cookies. Later she discovered that after being frozen the cookies were sensational! So, she went back to find the book, but couldn’t recall which book they had been found in. Finally, cookie lover and cookie recipe were re-united once again, and she still makes them to this day! It’s hard to resist them, and once again, they are super EASY! Need I say more? Melt 12 oz chocolate chips in a glass microwave-safe bowl and let cool. Cream 3/4 cup margarine and 1 cup white sugar. Add 2 eggs and melted chocolate. Beat well. Stir in 1 cup chocolate chips and 1 cup chopped walnuts (nuts are optional) Drop by small spoonfuls onto either silicone baking sheets, or greased cookie sheets and flatten by hand. Bake at 350 degrees F for 6-8 minutes. Easy and decadent – I can’t think of a better combination. I am very intrigued by your mum’s long-lost cookie recipe and am excited to try them. Love your site! Your food looks wonderful and delicious. I can’t wait to try some of your recipes that you have posted and I look forward to ordering your cook book. I plan on asking for it as a Christmas gift. I also love the stories you put with the recipes and helpful hints/tips. Don’t change a thing. I think you should try these with a bit of mint extract thrown in. 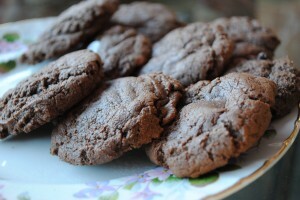 I remember having amazing chocolate mint brownie cookies, but could never get the recipe right. I think these would be the perfect cookies. now do they have to be frozen to then be fabulous? Am anxious to try but wanted to know if I should be sticking rifht into the deep freeze? I love baking cookies and cakes and your receipes are really good. We dont eat eggs, so can you tell me a good substitue for eggs in chocolate chip cookies. I really want to try these out. i love your website! I’ve been checking up on it for about 2 years now and i’m 17! i still haven’t tried any of your recipes though :/ i’m “gourmade”- i like to eat the food but not bake it. anyways, just dropped by to say that you’re doing great and please keep uploading recipes here! best regards to you and your family.